If you love the sounds and smells of nature, aluminum screen doors are the ideal way to invite clean fresh air and sunshine into your home, without the nuisance of bugs. 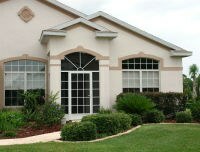 But many customers are concerned that the traditional screen door won’t match their home’s architectural style. Thankfully, screen doors have come a long way since your grandma’s rickety door. Identify your home’s architectural style. Your home’s structural and decorative features make up its architectural style. Realtor Magazine provides a checklist to help you identify your home’s style. Depending on the location and age of your home, it could be Mission Style, Mediterranean, American Foursquare or one of many other styles. If it’s a newly constructed or renovated home, chances are good that the architect or builder mixed more than one style to fit your climate and community. Since windows and doors are the primary exterior features that directly link to your home’s architectural style, it’s important to consider the look, feel and history of your home before choosing your custom aluminum screen door. Prioritize your goals. Now that you know your home’s general (or hybrid) style, you have a better sense of how to choose your exterior door. Will your screen door need straight clean lines with a simple appearance, or a more ornamental look? Should it follow a color palette to stay true to the historic character of your home? Some housing communities are within historic districts where renovations and exterior improvements are governed by an architectural review board. With these priorities in mind, you can consider the many screen door options available to find a door that meets your goals. Emphasize your home’s architectural points of interest. Does your home have large exterior arches or double French doors? You can showcase these grand features by adding a custom-built creative entrance to fit these entryways. The best screen door manufacturers allow you to choose a single or double screen door along with side-lites or sunbursts to create a custom screen enclosure. Make your screen door or enclosure uniquely you! Do you live in a community where most of the homes look the same? Ornamental accessories allow you to differentiate. There are a variety of aluminum castings and airbrushed figurines available to help you add personality to your door. Investing in the architectural integrity of your home will add beauty and value to your property. Get creative with our online tool and build your own creative entrance.